BACKGROUND: Histiocytic disease is a diverse disease, characterized by multisystem involvement, diagnosis and management can be challenging. Guidelines are important tool to provide evidence-based management; however, guidelines for management of adult histiocytic disease are scarce. METHODOLOGY: A multidisciplinary team from Saudi Arabia developed guidelines to manage the adult histiocytic disease with an intention to provide standard of care for diagnosis and management of the most frequently encountered subtypes of adult histiocytic disease in the region. RESULTS: Detailed guidelines to different categories of histiocytic disease were finalized after review of many international guidelines and extensive literature review. CONCLUSION: Local guidelines for adults histiocytic disease was developed and can be shared with different hematology centers. Histiocytic disease is a diverse disease characterized by tissue infiltration of dendritic cells. It can involve one or more organ or system. Histiocytic disease subtypes are rare, however, can be life-threatening if not properly and timely managed. Guidelines are important tool to provide evidence-based management; unfortunately, guidelines for the management of the adult histiocytic disease are scarce. To this date, there are no published guidelines from the middle east; furthermore, most of the international published guidelines are by the histiocytic society group, and they are mainly based on pediatric clinical trials. In our institutions, we treat young adolescents from 14 to 18 years as adults; however, knowing that this age group was considered as pediatrics in all international histiocytic guidelines, we have adjusted our guidelines to use similar protocols to treat patients up to 18 years. As for older patients, we will use an individualized strategy based on extensive literature review and expert opinions. In this manuscript, we are presenting our locally developed guidelines for the management of the adult histiocytic disease. We distributed the guidelines into three parts, guidelines for Langerhans cell histiocytosis (LCH), Non-LCH (N-LCH) and hemophagocytic histiocytosis (HLH). Histiocytic guidelines were developed by multidisciplinary team members including hematologists, pathologists, and clinical pharmacists. Our recommendations were based mainly on histiocytic society guidelines for patients age 14–18 years, whereas for older patients we created our guidelines based on extensive literature review and expert opinions. LCH is a heterogeneous disease characterized by tissue infiltrations of dendritic cells. Any organ or system can be affected. For diagnosis of LCH examination of tissues for morphology and immunohistochemistry (IHC) stains IHC is required. Definite diagnosis of LCH mandates positive IHC for CD1a and or langerin (CD207) or presence of characteristic Birbeck granules on the electron microscope. Electron microscope examination is not needed for diagnosis if langerin is positive as this correlate to the presence of Birbeck granules. Presumptive diagnosis is usually made only on radiological and clinical finding without tissue diagnosis e.g., typical lesions on chest computed tomography (CT). LCH with risk-organ (RO-LCH) bone marrow, spleen, liver, and central nervous system (CNS) involvement. Lung involvement is not considered by some group as RO. Positron-emission test (PET) scan has proven to be the most sensitive functional test used in the identification of LCH lesions and in evaluating patient response to therapy, if it is not available bone scan should be performed in addition to the skeletal survey. Central nervous system involvement – Intracerebral expansive lesions affecting the brain or meninges or magnetic resonant imaging (MRI) compatible with neurodegenerative disease or cerebral atrophy. Ears involvement – Recurrent/refractory otitis externa or otitis media. Eyes involvement – Ptosis, exophthalmos. Liver infiltration can result in sclerosing cholangitis. Atypical lung lesions confirmed by histopathology. Spleen involvement – Enlargement of 3 cm below the coastal region. Skin involvement – Any rash documented by histological examination. Pituitary involvement – Presence of diabetes insipidus (DI). Mucosal involvement – Oral mucosal lesion or genital lesion. Solitary lesion usually asymptomatic, infiltrative lesions can present with diarrhea. Grade 0: Divergence of opinions. History should include pain, fever, weight loss, night sweats, rash, lumps, constitutional symptoms, polyuria, polydipsia, history of learning difficulties, smoking history, respiratory symptoms, and family history. Complete physical examination, including weight, temperature, lymphadenopathy, and hepatosplenomegaly, and skin lesion, tenderness over bones, soft-tissue swelling, neurological examination, and cognitive function assessment. Blood test should include full blood counts, liver function, renal function, Serum sodium, serum and urine osmolality, gonadotropins, coagulation profile, viral serology, HIV, and serum ferritin. Tissue biopsy for specific (IHC) and ( BRAFV600E) mutation. Chest X-ray and PET scan. The presence of >5% CD1a positive cells in the fluid is diagnostic in nonsmokers (CD1a stain can be positive in BAL of smokers without lung disease). Lung biopsy if BAL is not conclusive. Endoscopy, audiogram, liver ultrasound, and other tests based on suspected sites of involvement. Single lesion in the oral mucous membrane. Treatment of SS-unifocal bone disease – Isolated bone disease can regress spontaneously. Bone lesion at areas with risk to CNS, for example, skull. Radiation might be considered (Grade C, 2) However, most experts do not recommend it due to the long-term sequelae. Treat as MS-LCH see section (1.3.8). Psoralen plus UVA, not indicated in scalp and penile lesions. Stop smoking. In some cases, this is enough to cause disease regression. Severe cases might need lung transplant for this reason avoid pleurectomy. Involve endocrinology to consider DDAVP (Desmopressin). No optimal treatment option yet. Retinoic acid, cladribine, vincristine + cytarabine, and IV immunoglobulin. There is no standard front-line regimen for adults as pediatrics where the standard for children up to 18 years is induction with one or two cycles of VBL/steroids followed by maintenance, for older adults this protocol did not show enough effectiveness, single-agent cytarabine or cladribine were found to be less toxic and more effective. We recommended treating patients from 14 to 18 years with VBL/Prednisolone Paediatric LCH protocols. 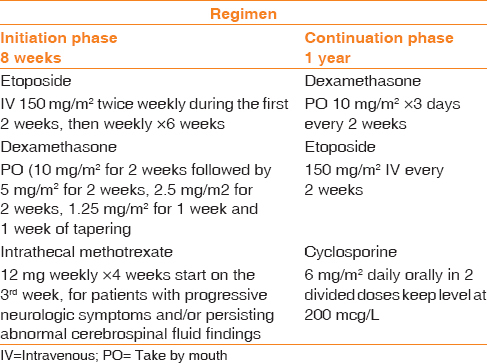 One cycle of VBL and prednisolone (6 weeks course) is recommended for patients from 14 to 18 years with MS-LCH regardless of RO involvement, the second cycle should be given if based on the response and RO. Prednisolone 40 mg/m2 day orally in three divided doses, after 4 week start reducing it taper off at 6 weeks. VBL 6 mg/m2 IV bolus weekly ×6 weeks. Assess after 6 weeks if in CR and no RO, start maintenance. If in PR or in CR, but RO give another induction with VBL/Prednisolone then proceed to maintenance. 6 MP 50 mg/m2 orally daily, for 1 year should be added to those with RO, (round down to the nearest 50 mg). Maintenance duration is 1 year. Assess after the first cycle if in CR, PR or stable diseases give maintenance cytarabine 100 mg/m2 D1–D5 monthly × 6–12 months (Grade D2). Assess after the first cycle if in CR, PR or stable diseases give maintenance Cladribine monthly ×6 months (Grade D2). Etoposide 100 mg/m2 D1–D5 q4w IV. Assess after the first cycle if in CR, PR or stable diseases give maintenance etoposide monthly ×6 months (Grade D2). 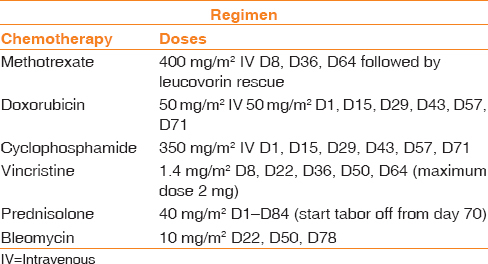 MACOP-B consists of short course of chemotherapy combinations that can be given as outpatient, [Table 1]. Azathioprine 2 mg/kg PO daily (Grade D1). For patients failed first-line therapy, it is recommended to contact LCH expert. General concept is to use different agents than induction therapy. Combinations of cladribine + cytarabine especially for cases with CNS involvement. Vemurafenib should be used within the contest of clinical trial in relapsed refractory cases with BRAF V600E mutations. Hematopoietic stem cell transplant (HSCT) should be considered for relapse refractory transplant-eligible patients. In pediatric studies, there were no conclusion about the preferred conditioning chemotherapy, whether myeloablative conditioning (MAC) or reduced intensity conditioning (RIC). In one study, relapse rate was higher with RIC. For adults due to the high toxicity with MAC we elected to give RIC for all our patients who are transplant candidate; however, this should be assessed case by case. Radiotherapy should be limited only to patients with risk of neurological deficit and high risk for surgery. Zolendronic acid can be used for multifocal bone LCH (Grade C2). After the end of first cycle patients should have full assessment by history, examination, laboratory and images, (All positive original testing should be repeated). Then reassess every 3–6 months for 3 years. Then assess annually for 5 years. After 5 years annual follow-up and images only per clinical suspicion. Erdheim Chester disease (ECD) is a clonal disorder, marked by recurrent BRAFV600E mutations in >50% of patients, nearly 100% ECD patients have the mutation if sufficiently sensitive techniques are used. Diagnosis requires the presence of certain histopathological and clinical features. Characteristic finding of ECD is tissue infiltration with foamy histiocytes, IHC staining is positive for CD68, CD 163, negative for CD 1a and langerin (CD207). Pseudo-tumor infiltration of the right atrium visualized clearly on MRI as a mass lesion, rarely causing valve dysfunction and conduction abnormalities. Usually asymptomatic, can present with cough, dyspnea, lung infiltrates, restrictive pattern on spirometry, fluid from BAL might show lipid Leiden macrophages. Unilateral or bilateral Periorbital involvement resulting in exophthalmos, eye pain, or blindness. Hydronephrosis, retroperitoneal fibrosis, and mass-like soft-tissue infiltration can occur. DI, erectile dysfunction and gonadotropin insufficiency. History should include history of bone pain, abnormal gait, weakness, decrease vision, polyuria, polydipsia, and constitutional symptoms. Complete physical examination looking for Skin lesions, soft-tissue swelling, xanthelasmas, fundoscopy, cardiovascular, chest, cognitive, and neurological examinations. For selected patients orbital MRI, electromyography. Dose of Interferon α (IFNα) 3 million unit 3T/week, for patients with high burden disease e.g., cardiac or CNS involvement higher doses as 18 million unit 3T/week should be used. Pegylated IFNα dose is 180 mg/week. Interferon should be continued till disease progression, lack of response, or intolerance due to side effects. Side effects: Fever, flu-like symptoms, myalgia, arthralgia, neurophyscatric manifestations, transaminitis, and pruritus. Common toxicities include fatigue, arthralgia, headache, and multiple skin complications. Patients need to sign informed consent as there is rare risk of squamous cell carcinomas after prolong exposure to vemurafenib. Cladarabine should be considered for BRAF negative cases that are unresponsive or intolerant to interferon. Dose (0.14 mg/kg) IV infusion 2 h daily for 5 days on a 28 days cycle, Up to 6 cycles. All patients should be given anti-PCP (pneumocystis pneumonia), anti-viral, and anti-fungal prophylaxis for 1 year after completing therapy. Organ-specific images should be performed after 3 months of initial therapy then every 6 months. Once disease stabilization is achieved, should be repeated only as indicated by changes in clinical status or laboratory values. Extra nodal involvement in 43% of cases mainly skin, soft tissues, upper respiratory tract, retro-orbital and bones. CT chest, abdomen, and pelvis. Patients with constitutional symptoms or sudden enlargement of lymph nodes need to be treated. Tyrosine kinase inhibitors (imatinib) should be used in the context of clinical trial. The hallmark of hemophagocytic lymphohistiocytosis (HLH) is immune dysregulation either familial or sporadic secondary to many triggers, the accurate and timely diagnosis is crucial due to the high mortality rate. Most of HLH guidelines were based on HLH-94 and HLH-2004 trials, the patients were mainly children up to 18-year-old with familial, sporadic or secondary HLH. HLH-2004 is an updated version of HLH-94, in HLH-2004 cyclosporine was added earlier with the initiation phase, both HLH-2004 and HLH-94 were not tested in adults but given the increased neurotoxicity with cyclosporine most adult experts recommended the use of HLH-94 protocol. After chemotherapy completion patients with familial or relapse refractory HLH were considered for Allogeneic stem cell transplantation if a donor is identified. Adults HLH (a-HLH) is more diverse, HLH-94 protocol might not fit all cases, there is no guidelines to treat a-HLH, and most recommendations are based on expert opinions. In these local guidelines, we will treat all patients from 14 years to 18 years with HLH-94 as well as some selected older adults, for the rest we will use individualized strategy as below. Low or absent natural killer-cell activity. Elevated sCD25 (α-chain of sIL-2 receptor). Detailed history including fever, family history, recent infection, weight loss, rheumatologic disease, or history of malignancy should be obtained. Full physical examination including weight, temperature, lymphadenopathy, skin lesions, hepatosplenomegaly, and neurological examination should be performed. Tissue or lymph node biopsy if malignancy suspected. HLA typing for the patient. This protocol consists of extensive cytotoxic medications given in two phases for total duration of 1 year. All patients on HLH-94 should be on PCP and fungal prophylaxis as well as proton pump inhibitors. Adult HLH is life threatening condition can lead to multi-organ failure if not treated properly, the type of HLH, i.e., primary or secondary does not affect induction therapy hence delaying the therapy for this reason is not justified. Identifying the cause is very crucial to choose the optimal therapy. It is reasonable to add etoposide to lymphoma cases treated with CHOP if they are fit. Consider Auto-SCT for lymphoma in CR1. For HLH secondary to bacterial infection give antimicrobials and Immunoglobulin. Treat infection, revaluate any new fever and give PCP, fungal and viral infection prophylaxis. RIC is the preferred conditioning regimen, 3 years survival with (MAC) VRS (RIC) was 43% and 92%, respectivily. Euro Histio Net Work Group for LCH Guidelines for Adults, Created; 2012. Available from: https://www.eurohistio.net/e1623/e1554/e3219/index_eng.html. [Last update on 2013 Aug 18]. Histiocyte Society Evaluation and Treatment Guidelines; Contributors: Milen. Vienna: Austria; 2009. Available from: https://histiocytesociety.org/document.doc?id=290. Haupt R, Minkov M, Astigarraga I, Schäfer E, Nanduri V, Jubran R, et al. Langerhans cell histiocytosis (LCH): Guidelines for diagnosis, clinical work-up, and treatment for patients till the age of 18 years. Pediatr Blood Cancer 2013;60:175-84. Derenzini E, Fina MP, Stefoni V, Pellegrini C, Venturini F, Broccoli A, et al. MACOP-B regimen in the treatment of adult Langerhans cell histiocytosis: Experience on seven patients. Ann Oncol 2010;21:1173-8. Veys PA, Nanduri V, Baker KS, He W, Bandini G, Biondi A, et al. Haematopoietic stem cell transplantation for refractory Langerhans cell histiocytosis: Outcome by intensity of conditioning. Br J Haematol 2015;169:711-8. Diamond EL, Dagna L, Hyman DM, Cavalli G, Janku F, Estrada-Veras J, et al. Consensus guidelines for the diagnosis and clinical management of erdheim-chester disease. Blood 2014;124:483-92. Haroche J, Cohen-Aubart F, Emile JF, Arnaud L, Maksud P, Charlotte F, et al. Dramatic efficacy of vemurafenib in both multisystemic and refractory erdheim-chester disease and langerhans cell histiocytosis harboring the BRAF V600E mutation. Blood 2013;121:1495-500. Rosai-Dorfman Disease, Therapy Recommendations by Histiocitic Disease Society; 2011. Available from: https://histiocytesociety.org/document.doc?id=54. Trottestam H, Horne A, Aricò M, Egeler RM, Filipovich AH, Gadner H, et al. Chemoimmunotherapy for hemophagocytic lymphohistiocytosis: Long-term results of the HLH-94 treatment protocol. Blood 2011;118:4577-84. La Rosée P. Treatment of hemophagocytic lymphohistiocytosis in adults. Hematology Am Soc Hematol Educ Program 2015;2015:190-6. Schram AM, Berliner N. How I treat hemophagocytic lymphohistiocytosis in the adult patient. Blood 2015;125:2908-14. Marsh RA, Vaughn G, Kim MO, Li D, Jodele S, Joshi S, et al. Reduced-intensity conditioning significantly improves survival of patients with hemophagocytic lymphohistiocytosis undergoing allogeneic hematopoietic cell transplantation. Blood 2010;116:5824-31. Devitt K, Cerny J, Switzer B, Ramanathan M, Nath R, Yu H, et al. Hemophagocytic lymphohistiocytosis secondary to T-cell/histiocyte-rich large B-cell lymphoma. Leuk Res Rep 2014;3:42-5. Patel A, Vakiti A, Chilkulwar A, Mewawalla P. Hemophagocytic lymphohistiocytosis secondary to bone marrow only B-cell lymphoma: A very rare entity with an even rarer presentation. J Hematol 2017;6:49-51.